BFF Facebook Typing BFF Comment on Facebook is Fake - BFF Hoax: Since last two weeks there is lot of circulation happening about Typing BFF will let you know about security of your Facebook account, but its a fake thing. Check below why it is for more details. Mark Zuckerberg, CEO of Facebook, invented the word BFF . 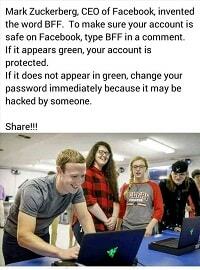 To make sure your account is safe on Facebook, type BFF in a comment. If it appears green, your account is protected. If it does not appear in green, change your password immediately because it may be hacked by someone. Actually #BFF Means Best Friend Forever Facebook and if you Mention a comment BFF, then it will display in Green color in comments box. But why some people are not getting in Green color is just because their Facebook App or the Browser Mobile or Desktop/Laptop they are using is not updated one, because Facebook uses the latest color codes, because of this few people are not getting color codes. So all in all Typing BFF on Facebook comment box is fake and Dont believe it, Its main purpose is for Spamming users to know who all are active. Kindly share this post and help is people not getting spammed and not believing in BFF fake stories. BFF is no longer working on Facebook. It's been stopped. so even if you type BFF now, it won't show any green colored text.